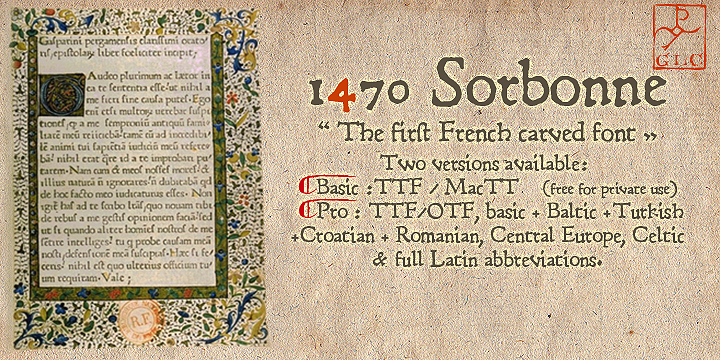 Jean Heynlin from Sorbonne University drew this 1470 Sorbonne font getting its inspiration from Pannartz’s which was ultimately carved to perfection by Adolf Rusch at the university’s printing workshop in Paris. Though the standard and historic ligatures and the Latin Abbreviations were from original, but a few like U, J, W and Y were added to this one style font family. The font is available in Central Europe, Baltic, Croatian, Turkish, Romanian, and Celtic and off course Basic Latin.